Hi friends! The countdown is ON! Can you BELIEVE that tomorrow is Halloween? My boys are so excited to get dressed up in their DIY costumes and go trick-or-treating! 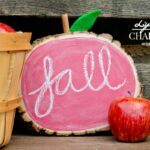 And of course I’m feverishly DIY-ing to the last minute trying to finish up my oldest’s pizza costume and throw together some fun crafts and treats. 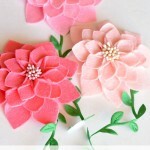 And HERE is one of them – the most fun and adorable DIY Confetti Favors! Now THESE are Halloween themed. I made my own confetti but threw in some skulls and pumpkins for good measure. 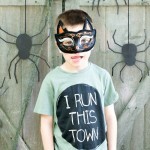 And while you may not be as crazy as me and actually whip these up for THIS Halloween, this cute craft can really be applied to ANY party you have. 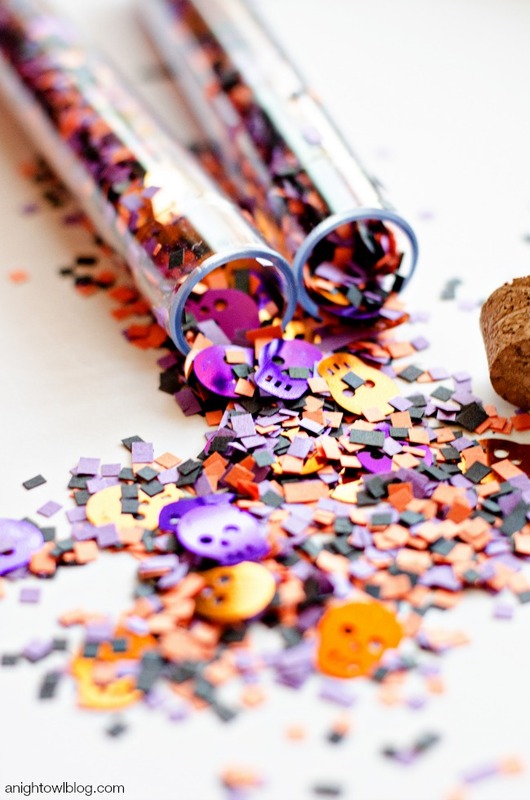 Because who doesn’t love a little confetti? Choose the colors of construction paper you’d like, to make your confetti! 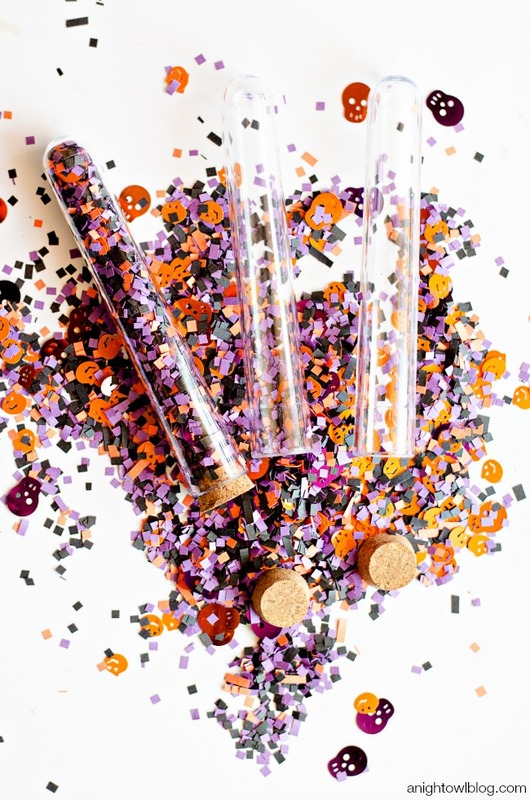 For ours, we chose purple, orange and black – perfect for spooky Halloween confetti! Using the fringe scissors cut along the edge of the construction paper until the full edge that the scissors can reach are fringed. Next go back with the scissors in the other direction, resulting in perfectly adorable little squares of confetti! Repeat with multiple colors and pages until you have the amount of confetti you desire. What you see here is 2 pages of each color. Add in “accent” confetti – we added small pumpkins and skulls for good measure! 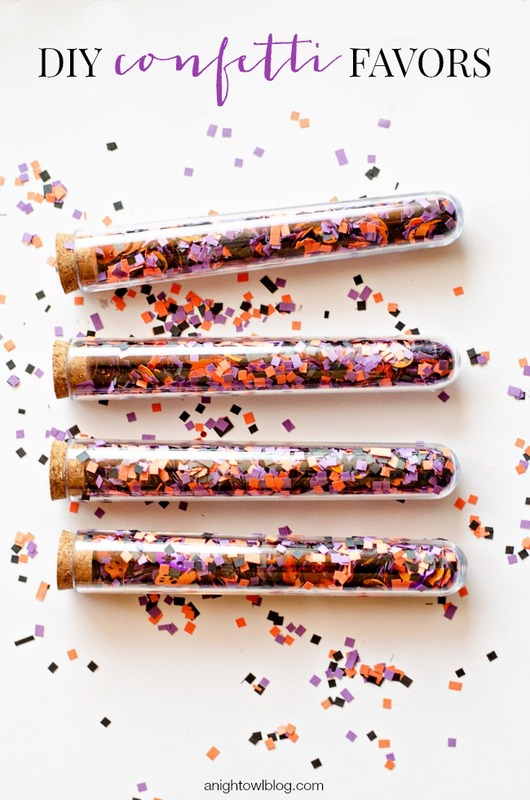 Lastly, add your adorable new confetti to the test tube favors! 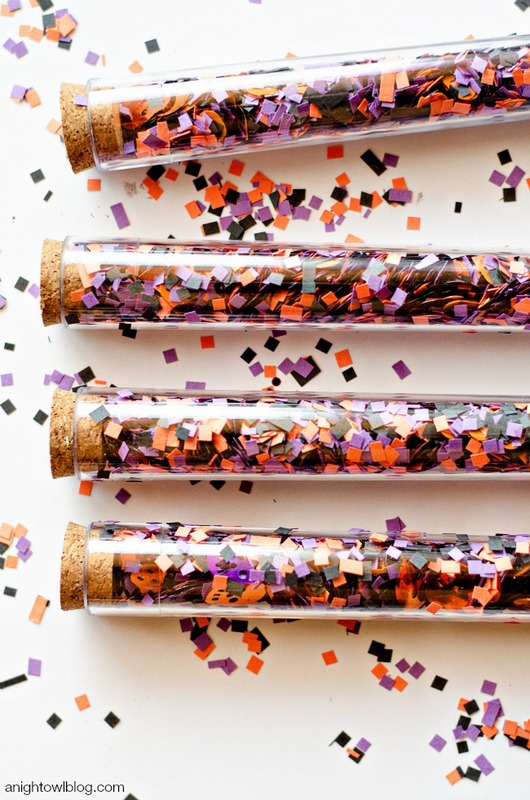 These tubes are PERFECT to hold confetti, seal and even empty and use again! And voila – what you get are the most adorable DIY Confetti Favors! What do you think?! So fun, right? I think I’m going to create DIY Confetti Favors for EVERY party we have from here on out! I’m not sure how my husband will feel, since there MAY or may not still be confetti hanging out on our kitchen table…but at least we’re going to be festive and ready for Halloween right? Whatever you do – we hope you have an amazing, fun and safe night with family and friends! That is some gorgeous DIY confetti!! love this. such a festive and creative way to package the confetti. What a darling idea and such a sweet gift! !